An enslaved man who mailed himself in a box to freedom across state lines. A ballerina of color who asked to paint her face white. An inventor whose creations include the traffic signal and oxygen mask. These are not works of fiction but true tales of American history brought to the screen by Sweet Blackberry, an organization that tells overlooked and little-known stories of African American accomplishments to children through animated short films. In 2014, ethnic minorities constituted the majority of children under 5 for the first time, according to the U.S. Census Bureau. And in 2015, ethnic minorities under age 18 constituted 48.5 percent of the U.S. population, according to nonpartisan research organization Child Trends. 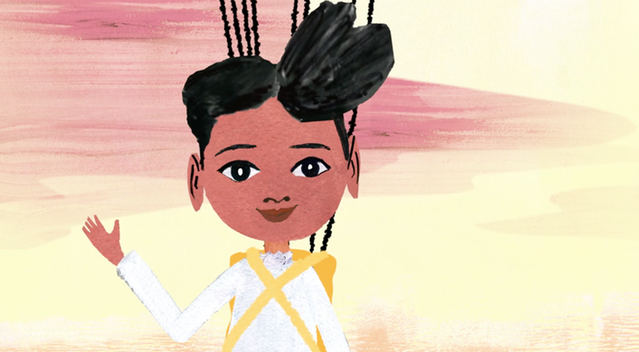 But children of color have historically received little representation in animated films, with early ones often portraying black characters as aggressive or unintelligent. In a 2016 analysis of the top-viewed cartoons among children ages 6 to 12 by the Children’s Television and Language Project at Tufts University, characters of color only held 17 percent of speaking roles. On average, kids consume over seven and a half hours of media per day, with the numbers even higher among black and Hispanic children, according to the Kaiser Family Foundation. And they deduce information about themselves and others — such as what possible career options are — based on the identities of characters they see on screen. TV consumption strengthens white boys’ self esteem while decreasing that of white girls, black girls and black boys, perhaps because of a lack of positive role models in media, a 2012 study found. The under-representation of people of color and women on film and television shows mirrors the lack of representation behind the scenes. The 2015 Hollywood Diversity Report from the Ralph J. Bunche Center for African American Studies revealed that white people and men dominate executive positions at television networks and film studios, with minorities directing 17.8 percent of the 174 films from 2013 that the report reviewed. Sweet Blackberry founder Karyn Parsons, who played Hilary Banks on the popular show “The Fresh Prince of Bel-Air,” seeks to combat this underrepresentation. Her organization’s latest project, “The Bessie Coleman Story,” will feature the first female African American and Native American pilot. The short film recently completed its fundraising campaign on Kickstarter, and Parsons expects it will be released in February 2018. We spoke to Parsons to find out how Sweet Blackberry, which also hosts workshops for students, makes history relevant to kids and seeks to change the conversation on race and history. How do you make these stories speak to children? I think meeting them where they are is really important, not just preaching, “This is important, you should know it.” The people and their achievements are important but what is equally important is that you’re able to be heard. Why do you think these stories are important today? The risk of them being lost. As more time goes and they’re pushed to the wayside and textbooks are rewritten and things are omitted for whatever reason, I think that’s really dangerous and we risk losing the stories and people’s contributions and what the truth of history was entirely. I also think that right now more than ever a lot of young people are feeling very small, very helpless, and a lot of parents are feeling very confused, angry, small and helpless … so we bring stories like the Bessie Coleman story, someone who in [the] 1920s as a black female in the United States was told, “No, you can’t fly, you’re black, you’re a woman, and we won’t even teach you how to fly.” At that time, with all the incredible gender and racial discrimination that was going on in this country … she went [to France] and was the only African American and Native American female in her class. She learned how to fly and she comes back home with an international pilot’s license, which Amelia Earhart didn’t even have yet — she wouldn’t have hers for two more years. How do you choose which stories to tell? I have some stories that I’ve wanted to tell for a while and I haven’t figured out how. So there might be really great people with incredible accomplishments but if I can’t figure out how to bring them to kids where I think kids will really get it and be locked in and say “Oh, I understand this,” then I don’t choose that story yet. What has been most rewarding about telling these stories? I think learning about these people is so exhilarating. Like right now with Bessie Coleman, I think of her smile and I get excited about exactly what I’m trying to give children — I get excited about what I’m capable of and what I can do. I think of the real person and not just the black and white sepia tone photo in front of me. I see her and I picture her as a real living breathing person in front of me and I’m just blown away by her passion and all of this personality. The other thing is bringing it to kids. I go in schools around the country and I screen the films and watching [the kids] watching the film and talking to them is the best. Your collaborators behind the scenes, like illustrators and narrators, include many prominent African American artists and creators. Why is representation behind the scenes important to you? I think when you’ve got someone who understands firsthand what it means to be a brown person who’s discriminated against, or can relate to a lot of the things that you’re telling, it’s going to affect your storytelling differently. It’s a different perspective that you’re coming from and there’s so much richness and value in hearing from people who understand in a more firsthand way. I’m not saying other people can’t tell these stories, but I think it’s going to be different when you hear from people who can contribute [their] experiences. What range of responses have you received? What do you hope viewers, in particular African Americans and children, gain from these stories? I hope these stories can be reminders to people of what they’re made of, who they are, that they are strong and they are capable of incredible things beyond what they can imagine. That goes for black and brown audiences but I want people to understand that these are American history stories. They’re not just black stories that should be relegated to Black History Month or to black studies. I know we need Black History Month and we need a focus on black history but we can’t just relegate it to a boutique history. It is the history of this country. … It’s not just a little side history that’s just for black people. Quite the contrary. It’s very important that everybody knows this. It will affect how we all look at ourselves, our neighbors, and all of our value in this world. I’m glad I’m telling these stories to really young kids because hopefully they will grow up knowing this … they will look at themselves and their neighbors differently than this whole separate, ”Oh you only hear about a few black stories once in awhile,” which sends the message, I’m afraid, that only a once in awhile a black person comes along and does something great. It’s so far from the truth. When I visit the kids and I see their responses I think, “That’s what I want.” They’re so open and receptive. They all recognize the value. Little kids don’t tend to have that racial delineation yet, so all kids are looking at these stories as important and I want that to continue as they grow older.